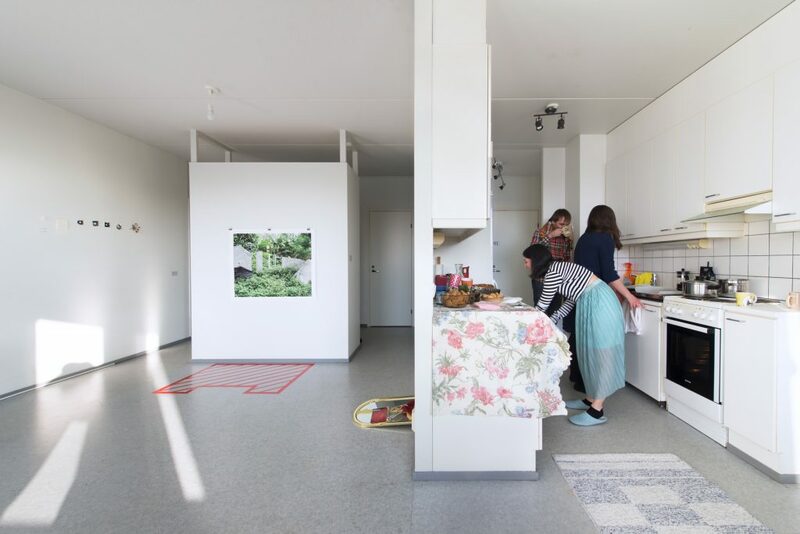 After months of living alone in a new country in an empty and unfurnished apartment, with large and bright open spaces, the thought of continuing not to make use of this space seemed wasteful. Particularly wasteful as artists in an urban environment where finding space to work and showcase that work is a continuous obstacle. The strangeness of having so much empty space that hovered between being occupied and unoccupied, needed and useless, home yet not home began to take shape with the parallel strangeness of needing to set up a life in a new place while knowing also that that life was never going to be permanent. An increasingly common phenomenon, the contemporary condition of transience seemed perpetually present on the periphery of our own and our acquaintances’ practices. Both as theoretical content and as a practical reality affecting living and working conditions, thereby became a presence in our artistic work. Distance as a barrier is collapsing, the ease of travel and communication has made it easier to set up and abandon temporary lives all around the world. 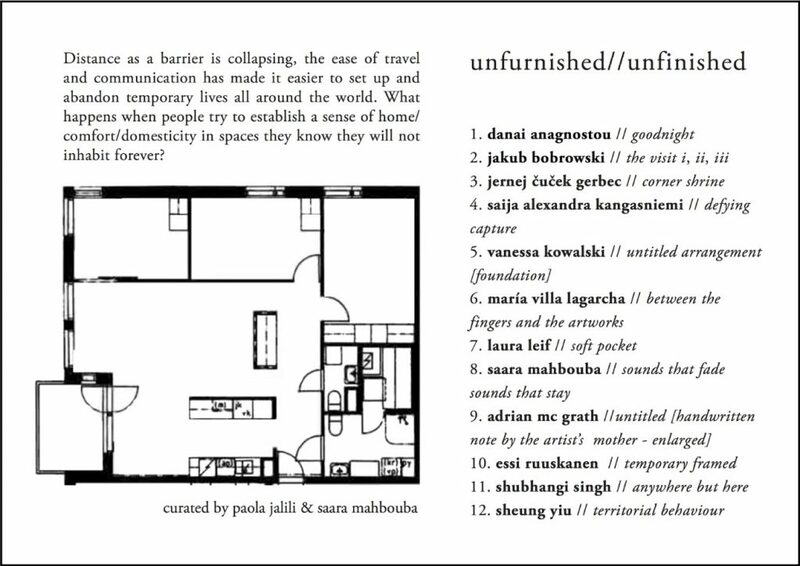 What happens when people try to establish a sense of home/comfort/domesticity in spaces they know they will not inhabit forever? Unfurnished//Unfinished was an attempt to center this topic, refocusing it from a necessary and present but unremarkable irritant to a central and present question of its own right. 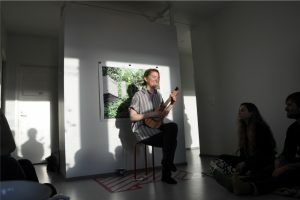 We wanted our exhibition to include individual artistic commentaries and explorations of this topic, but also to operate as a whole, as something of an experiment in questioning the limits of one specific space and its ability to hold meaning. Transforming the temporary living space that was Paola’s apartment into something that existed at the intersection of a home, an art space, a setting for social gatherings etc. 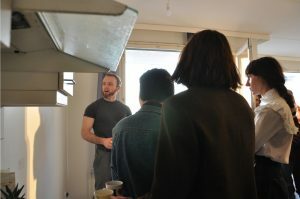 became something of a performative act in which we acted out versions of ourselves as curators, homemakers, and social beings trying to set up new lives. 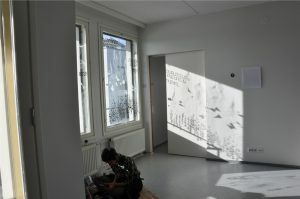 As we received submissions and were faced with the more concrete task of curating the space, it became increasingly difficult for us to conceptualize what exactly the space was, what into what were we transforming? Was it a home pretending to be an art space or a space masquerading as a home pretending to be an art space? We felt in a way that if we were commenting on home, maybe we needed to start with more of a home or by building a home. 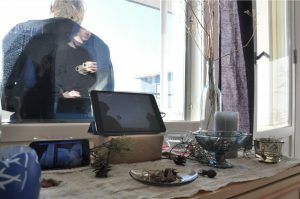 We ended up “faking” a home to a degree by bringing Saara’s belongings and borrowing “homey” items from around the art house, thereby adding another layer of performativity and instability. Alongside our reality of building a non-permanent life in a new environment and the curatorial act of transforming a temporary living space into a temporary art space, we were simultaneously envisioning and building a non-permanent false home to seem real enough to highlight the falseness of our “gallery,” a gallery whose falseness then sharpened the realness of our “fake home”. Going through the motions of enacting these levels of falseness and performativity ended up creating a different sort of realness in its own right. 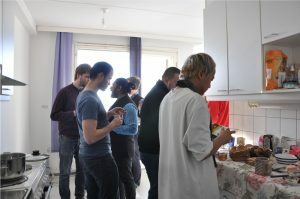 By creating a false home, we became homemakers, by acting the role of homemakers (making coffee and pulla, washing dishes, serving…) we made the false home into a real home. Artists, visitors, curators and friends flitted seamlessly in and out of temporary roles and identities, play acting our realities. Through acting out these temporary, insubstantial gestures of homemaking, curating, art making, music making, feeding, serving, cleaning, eating, drinking, talking, critiquing, socializing, we as a community performed a home and an exhibition that revealed its own realities of what it means to make and maintain a life, a home, and an artistic practice. 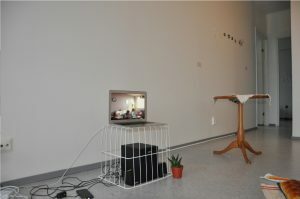 The following documentation attempts to trace the performative construction of home and meaning within a space through the performative aspects of maintenance. Unfurnished//Unfinished will transform a living space into a temporary gallery that deals with the contemporary condition of transience. 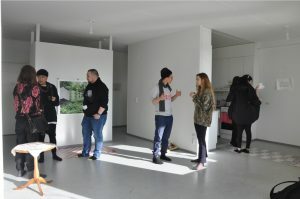 We are interested in artwork related to this topic; potential themes include but are not limited to: displacement, temporary housing, the emotional significance of a home versus a shelter, comfort without permanence, domesticity, filling an absence, habitation vs. home, occupying vs. inhabiting. If someone is not available on Saturday an earlier date for drop off/installation can be arranged. 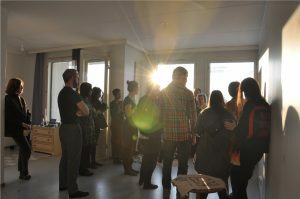 Instead of a traditional, opening/closing format, we are bracing the spirit of our exhibition space and inviting people over for a series of gatherings called Iltakahvi I, II, & III (evening coffee in Finnish). Pohjavedenkatu 4A, Vuosaari, 00980 (East Helsinki). Unfurnished//Unfinished will take place in Paola’s AYY apartment, which has a large, unfurnished living room that will be used for the exhibition. Balcony space is also available. *Deinstallation: after the closing. A different date can be arranged if you are no able to come that day. Borrow from the arthouse: mugs, candle glasses, tablecloth, hammer, screwdriver. Buy: pulla, coffee, tea, milk, etc. 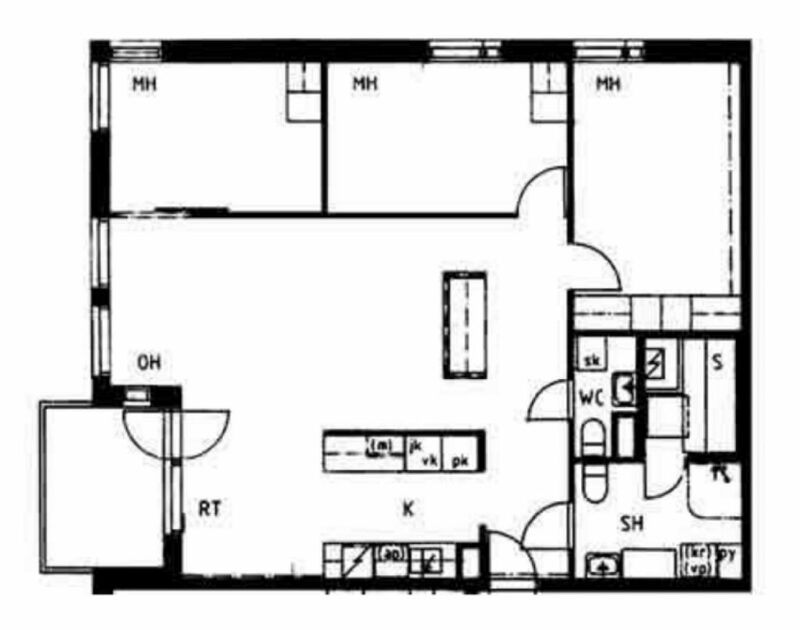 Should this be in a separate room (sound piece)? *Sheung is coming two hours before the opening to take the documentation photos. *Have some snacks and coffee/tea for the artists. Welcome to Iltakahvi I brought to you by Unfurnished//Unfinished, a housewarming party for a temporary living space caught between being a home, a shelter, and a space of artistic exploration. Come over for some coffee and pulla as we engage with what makes a home home. New friends welcome! Tervetuloa!